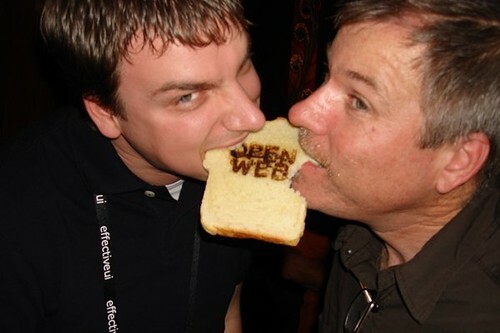 A Toast to Joseph Smarr and the Open Social Web! My “partner-in-crime” for the past three years, Joseph Smarr, has just publicly announced that he’s leaving Plaxo (after eight years!) and will be starting an exciting new job at Google early next year. He’s been tapped by Google to “help drive a new company-wide focus on the future of the Social Web”. As much as I hate to see the breakup of the greatest two-man team I’ve ever been a part of, I’m truly excited for Joseph and wish him all the best in his new role. More importantly, I think being a part of Google will enable Joseph to have an even bigger impact on the emergence of an open, interoperable Social Web, built on the Open Stack, and with users in control. Man.. what are you without him? Hmmm. Let’s see, er, um, someone who’s been making an impact on the evolution of the Web since 1994. Is that a good answer for you?